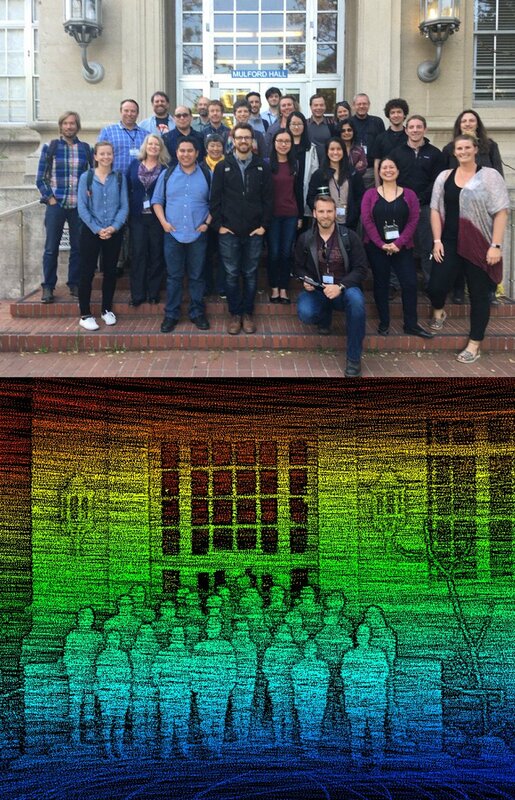 One conventional photo, and one with side looking Lidar, of bootcamp participants in front of Mulford Hall, UC Berkeley. Amid mixed funding news today (one SSHRC Insight Grant funded, one not; one Nova Scotia Graduate Scholarship awarded, one not), the Spatial Science bootcamp adjourned with a day of data visualization and web mapping. A blinding array of options and inspiring examples were presented by members of the GIF and iGIS. Clear to see that a conventional Geography degree will not prepare you for this kind of work: programming is critical. We also learned about the risks of using open source, as the software Carto changed versions 15 minutes before class started, leaving all the instructions moot. I wound up with good ideas for my fall Special Topics course, and a wider understanding of what is happening behind the scenes of web mapping services. Special thanks to Shruti for helping me hack the new Canadian Geographic hydroelectricity webmap for GeoJSON files of infrastructure. At the end of the day, several of us Ubered to the ‘Albany Bulb‘, a former landfill site and homeless encampment, and current dog park, ad hoc gallery of garbage art and graffiti, viewpoint for great sunsets, and general ‘scene’. Afterward we had what seemed like a quintessentially (and comically) Californian time at restaurants Ippuku, a Japanese small plates restaurant, as well as the diner we stumbled into (oblivious that it was vegan) to fill up afterward. How did they made apple pie pastry that flaky without butter? Looking from the Albany ‘Bulb’ across to San Francisco (photo: Scott Hatcher).